Have you ever heard about water damage? I’m sure you have. I can tell you a lot about how destructive water damage can be for your home, especially bathroom water damage can be very damaging. Especially if left untreated for an extended time. The worst part is that the water damage can negatively affect not only your property, but also your budget. In some cases the repair job is very expensive. Unfortunately, most homeowners don’t even notice if anything goes wrong or see it too late, when the water damage has already taken a toll. Here is one of the examples. 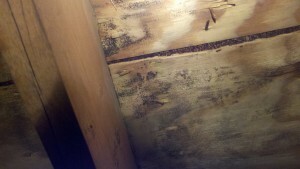 But here the damage is caused not only by water, but also by termites that like places with extra humidity. Keep in mind this fact: if there is the water, there will be a perfect environment for termites. Never forget about it, even if your home has been treated. In this case, water damage happened because of exterior trim has rotted away and there was no caulking to seal. That allowed water to stay in between the wall cavity. It was a trap for the water that left it in insulation, while the wood product continued rotting from the inside out. One of the best solutions to prevent this situation in future is regular caulking. Simple as 1-2-3. On this picture you can see another water damage, which occurred in a crawl space. It happened because of too much humidity and condensation in that area. As a result, the hardwood floors had to cup. It was becoming worse every single day, until the moisture was taken under control. We’ve installed a dehumidifier along with the vapor barrier. That was just another story, but I can go on telling more and more, adding the photos. As a homeowner, you should take a look around your house and see if there are any problem areas. So, you can take care of them before they finally get out of control. Contact us today and we’ll make a professional exterior home inspection for you. We’ll show you the problem spaces and tell you how you can solve the problem and maintain your home. Call 1 Home Repair today and we’ll take all your water damage troubles: 704-614-3420.